Day Passes are $30 each. You can purchase your day pass at the local businesses listed below. Passes can also be purchase directly at the gardens during the event. Delight in touring 7 superb private gardens in North/Northeast Portland plus free Digging Deeper programs at Garden Fever and thicket nursery. All that, plus there’s a Wrap-up Reception at Portland Nursery. 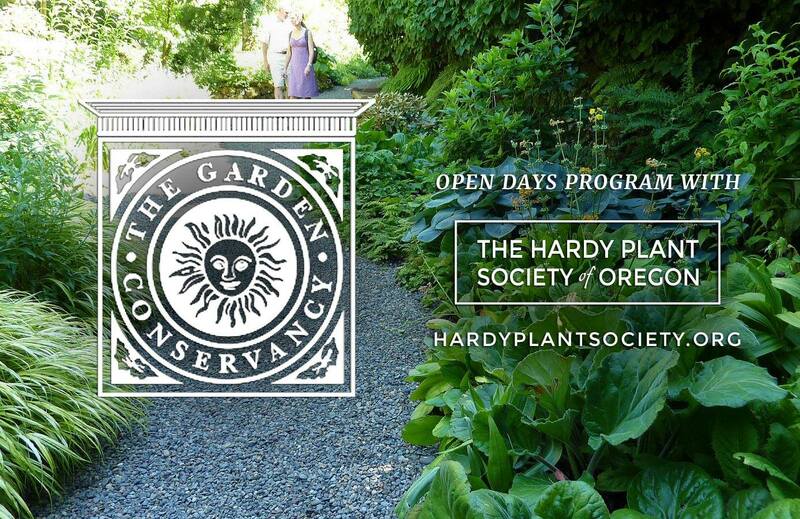 You’ll enjoy a day filled with gardening fun and learning plus you’ll be supporting The Garden Conservancy and Hardy Plant Society of Oregon’s Grants & Scholarships program. Founded in 1989, The Garden Conservancy has helped save or restore more than 80 gardens in North America. In 1995, The Garden Conservancy began organizing the opening of private gardens from coast-to-coast across the USA as a fundraiser to support their mission. This program has facilitated more than 75,000 garden visits to more than 3,000 gardens. HPSO has partnered with The Garden Conservancy to sponsor an Open Day for visitors to tour private gardens in our local neighborhoods, focusing on a different part of our region each year. For 2018, the 7 private gardens and the Digging Deeper programs are all in North and Northeast Portland. In supporting the mission of The Garden Conservancy, your ticket will be championing the continuing efforts to maintain gardens across the nation for public viewing. Some of those gardens in the Pacific Northwest include Peninsula Park Rose Garden (Portland), Elk Rock Gardens at Bishop’s Close (Portland), Gaiety Hollow (Salem), Historic Deepwood Estate (Salem), Mukai Farm & Garden (Vashon Island), The Dunn Garden (Seattle), PowellsWood Garden (Federal Way), Soos Creek Botanical Garden (Auburn) and others. Your ticket to Open Day also makes it possible for HPSO to award thousands of dollars in grants each year to non-profit organizations throughout Oregon and Clark County, Washington. HPSO grants support projects of botanical, horticultural or historical interest plus children’s education and community gardens. Recent awards have been to Connie Hansen Garden Conservancy in Lincoln City, Boy Scout Troop 194 for construction of a green roof learning center, Springwater Environmental Sciences School for construction of a native plant garden integrating science principles and a garden at Raphael House, a domestic violence shelter. Additionally, HPSO awards scholarships to students enrolled at local community colleges in horticultural programs.